Ponti took his first job with an Italian ceramics company, serving as artistic director, and began to pursue architecture soon afterward. It is possible that his early career in ceramics design influenced the rest of his career, as Ponti never viewed architecture as simply creating buildings. Instead, he often conceived of the building’s interior as well, creating furniture (chairs, coffee tables), lighting appliances, and even items like ceramics, glassware, and silverware. Ponti’s career was so diversified that he left his mark on the world not only through buildings which are still standing, but also within the art community, the industrial design sector, and even publishing houses. Clearly, Gio Ponti was not simply a man who worked in design, but a true artist whose talent and passion emanated from his core. 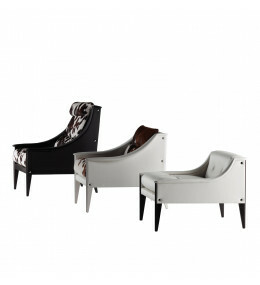 Dezza Armchair available in 3 dimensions with upholstery in leather and fabric. Dezza 2 Seater Sofa also available.